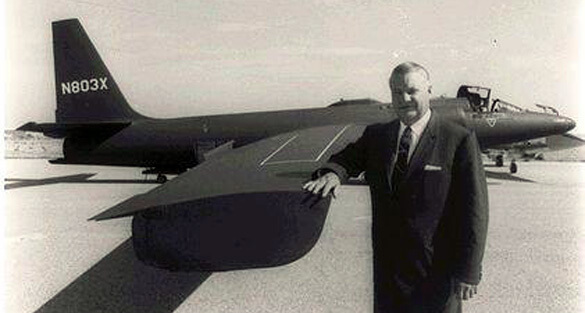 One UFO case investigated by the U.S. Air Force was a UFO sighting by Clarence “Kelly” Johnson. In his day, Johnson was Lockheed Skunk Works’ first team manager and aeronautical engineer and spearheaded the team responsible for developing a super secret high-tech aircraft that eventually settled in the now infamous Area 51. Indeed, Johnson helped scout the location and was responsible for the initial construction of Area 51 and played a key role in the development of many of their aircrafts, including reconnaissance planes U-2 and SR-71: Both of which were often mistaken for a UFO, in their day. However, unlike other people working at Skunk Works, who claimed their aircraft was behind the spike in UFO sightings, including some made by the CIA, Johnson said he saw a UFO, on at least in two separate occasions, and he believed that phenomenon to be real and unexplained. I should state that for at least five years I have definitely believed in the possibility that flying saucers exist — this in spite of a good deal of kidding from my technical associates. Having seen this particular object on December 16th, I am now more firmly convinced than ever that such devices exist, and I have some highly technical converts in this belief as of that date. These other witnesses and eventual converts turned out to be the crew that flew the Navy’s Super Constellation WV-2, which also witnessed the UFO sighting (in December 16th, 1953) that both Johnson and his wife saw. Johnson’s report, along with several of the crew Constellation’s can be found in the Project Blue Book report. In his reports, Johnson claims that the UFO sightings took place at his ranch, three miles west of Agoura, California. He states that he and his wife were just arrived at the ranch at approximately 5 pm. On approach, he saw something that resembled a black cloud, but then noticed that it does not look much like other clouds, so he thought it might be an airplane. Curious, he looked more closely. At the time, he felt possible that it may be lenticular clouds, a type of cloud formations that can appear over the mountains. Their disc-shaped appearance is often mistaken for UFOs, to the present day. He asked his wife to bring him a pair of binoculars. He did not want to take your eyes off the object. Johnson later insisted that it is not to move or fall apart as would be expected of a cloud formation. In his reports, Johnson estimates that both he and his wife observed the object hovering silent and still for at least three minutes before it suddenly began to move again. Due to having no reference from which to guess the UFO’s size, Johnson says he believes it was very large. Thoren’s own UFO sighting, Johnson confirmed, took place while piloting the Navy Super Constellation. He was the co-pilot at the time. Flying with him were P.A. Coleman (chief aerodynamics engineer) Roy Wimmer (engineering test pilot) and Joe Ware (flight test engineer). All of the above wrote their own reported versions of what happened that night. Their stories are very similar. After the completion of their trials, pilot, Wimmer, transferred control to Thoren. They leveled off at around 20,000 feet and this is when Wimmer noticed something strange and unlike anything he’d ever seen. Wimmer later said in his report that he’d cried out more for fun. Ware also admitted to ridiculing Wimmer over his UFO interest. It transpired that Wimmer had a UFO sighting with another colleague, two years previous to this event, over at Catalina. To start with they thought it was just an unusual cloud, but the longer they observed it the more they became convinced that it was actually a solid object. They said that was a crescent-shaped, or perhaps flying wing. Wimmer estimated the object to be at least fifty to sixty kilometers in length. He said 5 minutes later, he noticed that it was flying away from them and heading west. A minute or two later it became smaller, before then disappearing. I might add that I have had considerable experience, while doing radar bombing on P27′s, of estimating distances where there is very little to judge by and I am convinced this was a large object some distance away. Map of the positions of the witnesses created by The UFO Partisan. The Project Blue Book file has a drawing of the UFO that Johnson claimed he saw in December 1953 and also the object he saw in the previous UFO sighting he had in November 1951. Image from the UFO Partisan website demonstrating the similarity to the UFOs Johnson saw and the stealth bomber. He wonders whether Skunk Works was influenced by the sightings. Project Blue Book files consists mainly of the reports of witnesses. There’s no indication the investigation took place. Even though all the witnesses were pilots, and all considered and ruled out as an explanation of the cloud, they saw a cover letter for the file concludes that it was a lenticular cloud. Some even speculate that Project Blue Book is a hoax. Despite the conclusion of the U.S. Air Force, due to the high reliability and examination of witnesses, many UFO researchers see this as one of the best UFO sightings that exists to date. It’s also a great bonus, for UFO researchers, to list Johnson as the person who scouted out the location for Area 51. He was also the first leader of the team organizing the famous Skunk Works as someone who took UFO sightings seriously. It may, at first, have been comforting for Johnson to share if UFO sightings with some of the colleagues, who probably laughed at him for his beliefs but at least he will no longer suffer ridicule alone. And even though the U.S. Air Force did not seem impressed by the UFO sightings and reports, it still begs the question ‘who is the real power here anyway?’ Air Force investigators who investigated the UFO sightings or some of the best engineers and test pilots of their time. Trusted and capable people who worked on the most advanced aircraft known to man.